I am in the process of completing a book to be titled: The A-Z Guide To Collecting Trivets. It will be published in the Spring of 2004 by CollectorBooks. 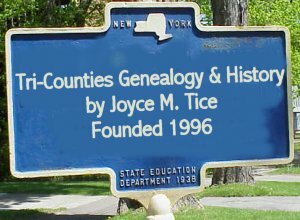 I wanted to thank you for your wonderful website, Tri-Counties Genealogy & History/Commemorative Flagholders & Plaques. It has been very helpful in identifying many of the horseshoe plaque trivets in my collection. They are fraternal collectibles from the 1890's to 1920's which often share many of the same symbols and mottoes as those on fraternal gravemarkers and flagholders. 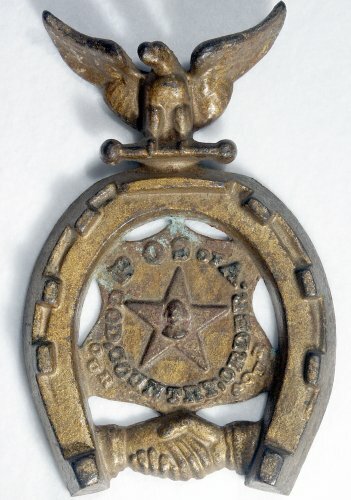 I attached a photograph of one for you to see, a POS of A Patriotic Order Sons of America) plaque trivet. it would be very helpful to others who are trying to catalogue obscure fraternal plaque trivets in their collections! I have already listed your website as a reference in my book, but would also like to list your name and city/state on my Acknowledgements page. Let me know how you would like that to read.